Walking home from a concert on a rainy Saturday night two images struck me. Behind the images are two recent news stories, but what else do they have in common? At the Maison des Métallos in the 11th arrondissement, a poster announces a play that is currently running at the theatre inside. 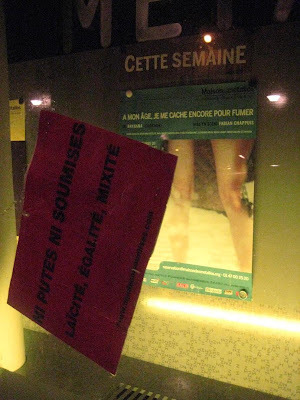 Nothing exceptional about that, but pasted on the window outside is a second banner from a feminist pressure group. This has not been put here in protest at what is playing inside, but rather in support of the writer and actress of the play, Rayhana, who last week was attacked on her way to a performance. The play, called 'A mon age je me cache encore pour fumer' ('at my age I still hide when I smoke') discusses the role of women in Algeria, and is critical of men in this society. Taking such a position should not present any problems in France, but the Maison des Metallos just happens to be opposite one of the most radical Mosques in Paris. Rayhana was attacked from behind, covered in white spirit, then had a cigarette thrown at her, by people, she believes, who knew who she was and what she had produced. On a more trivial note, in the Metro, a striking poster but with something very clearly missing. If you can't guess what is absent, scroll down to the same poster that is visible just about everywhere else, including just outside the Metro station concerned. 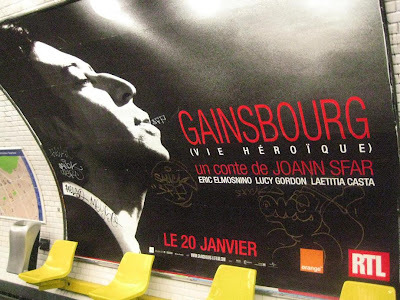 "Dieu est un fumeur de Havanes" sang Serge Gainsbourg, but not in the Paris Metro. The producers of the film had carefully designed a poster that showed the singer smoking, but without a cigarette. 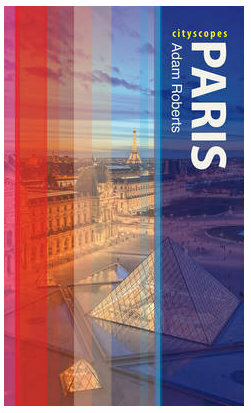 Not acceptable to the RATP though who feared attacks from anti-smoking groups for promoting tobacco'. Smoking kills so we hide it away. Stupidity kills but it is all too visible. Two stories on stupidity; one of course much more serious and unacceptable than the other! Ces deux éléments posent au delà de la remarque, juste, de Peter, la question aussi de la perception et du pourquoi d'un comportement. Celui du fumeur. Autrefois on fumait pour se donner une posture, par conformisme aussi. Les stars avaient une cigarette en main parce que cela ajoutait à leur jeu et cela leur donnait une contenance, la fumée était intégrée dans l'image. De fil en aiguille, les gens s'identifiant aux stars fumaient. Mais à l'époque "on ne savait pas". Maintenant qu'on sait, pourquoi fume-t-on, pourquoi certains et pas d'autres ? I can attest to the stupidity of smoking. I've just been watching a TV programme on Gainsbourg and I realised that my message here wasn't very clear. 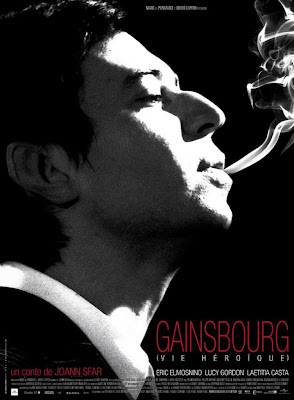 In almost every shot we saw Gainsbourg smoking and sometimes drinking, and rather than shock it was actually quite refreshing. People doing on television what they actually do in their own lives. Contrast this with the situation today where even a puff of smoke on a poster promoting a film is not deemed acceptable for public view. The act of smoking a cigarette was the superficial link between the images in this post. As in the play though, this simple act is also a metaphor for the erosion of individual liberties. To a greater and greater extent, society sits in judgement of our personal lifestyle choices. Authorities tell us it is 'for our own good', but if we are encouraged by society to constantly judge others, should we be surprised when it leads to such terrible attacks as the one suffered by Rayhana? So sorry to hear of what happened to Rayhana, I hadn't seen anything about that story in the press here, but then I'm not the most avid local newshound around... but it is just another example of how women are considered by some people in some cultures... most unfortunate. To try to burn someone to punish them for freely expressing their point of view ? That's just sick by any standard. Thanks for bringing this to our attention. I understood your intention and I kind of agree, but some people are just too stupid to do what's right on their own and need to be told. A sad state of affairs, but true none-the-less. Over-population is a waste of humanity.